our last lot of 400 pair of eyeglasses. 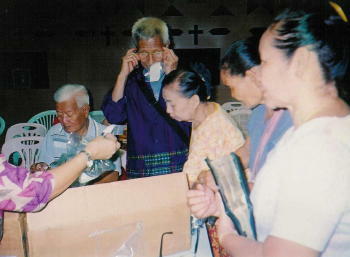 We gave the remaining stock of used eyeglasses to the Lion's Club. LifeNets has worked with Lion's and their eyeglass programs through the years as you can see in the stories below. 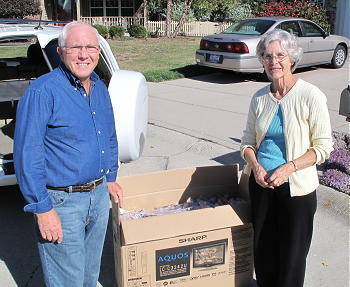 Director Bob Price came by our home on October 6, 2010 and picked up 400 pair of glasses that were all cleaned and each individually put into a Ziploc bag. Bob Price was leaving with others on a mission to Central America in a few days and was taking these glasses with him. We are happy that the glasses found a home with people who really needed them. We always ask our donors to please soak the glasses is a mild soapy solution for 20 minutes and put each pair of glasses in a zip lock bag. That way the glasses are clean and presentable. At LifeNets our focus is no longer eyeglass distribution. The reason is that we no longer have the connections to give DIRECTLY places to give glasses to such as Thailand, Central Africa and other places. 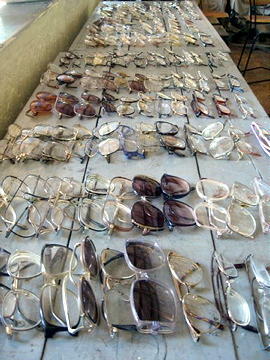 We want to thank all who helped us with eye glass collections. 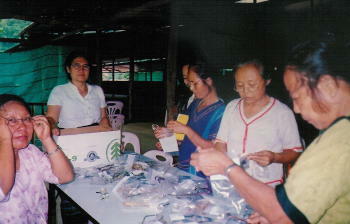 We have been asked to help provide eyeglasses to refugee camps in Thailand for the Karen people from Myanmar. Some of the refugees have immigrated to the United States and have become citizens and want to work with LifeNets to facilitate the distribution of eyeglasses to the refugee community in Thailand. 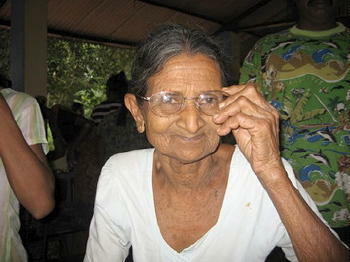 We are also sending eyeglasses to other people such as the Sri Lanka who suffered greatly in the 2005 Tsunami. 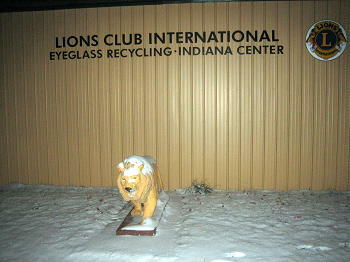 Working through Prevent Blindness Indiana and the Lion's Eyeglass Recycling-Indiana Center, we have found a source and means to provide sizable help. We have also received many pair of eyeglasses from the Builders Club, an outreach club at Derryfield School in Manchester, New Hampshire Read our story of helping people in a refugee camp of more than 50,000 population. Read our reports below. On Tuesday, May 12, 2009 we in Malawi were blessed upon receiving various types of items, eye glasses, blankets, and toys from America. Thank you. This came as a surprise, and yet a timely thing considering that it was cold season, the problem of eyes among them, especially elderly people and that most parents can not afford to buy toys for their children. Most people in Malawi live day to day life with the problem of eyes hiding somewhere unnoticed, and yet thousands are suffering. A lot of people with eyes problems cannot afford to buy glasses from the private and even government hospitals simply because they are very expensive. One eye glass can cost MK15,000.00 (USD 107.00). A total of about 20 people in Blantyre received eye glasses and 40 were sent to Lilongwe. Dr. Chilopora, who also is running a LifeNets funded Clinic in Balaka district advised recipients to know the status of their eyes before putting them into use by going for testing. Other eyeglasses are being kept for future use in case of damage. When the time came for the children to receive their items, smiles were everywhere. They received white shirts, white blouses and also toys. In Malawi where most people live by less than a dollar a day it is difficult to buy clothes and for a toy it’s a thing that they can not afford. Remember "to give is the greatest of all". And this is a perfect example. Wonder where eyeglasses you donate to LifeNets go? Below is her report from a trip that spanned the last part of December 2007 and the first part of January 2008. 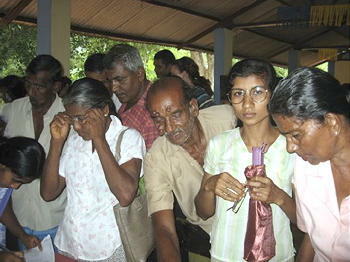 The eyeglasses were sent on October 16, 2007 from Cincinnati to Sri Lanka for distribution. We arrived at the Mahasena Village in Sri Lanka to help complete the school's library and furnish it with much-needed books. This particular school in rural Mahasena, is about six hours north of Colombo, near the famed Sigiriya rock fortress, dubbed the 8th Wonder of the World. 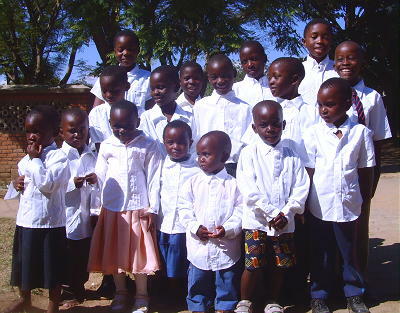 The school is very impoverished and they greatly lack many supplies which many kids are used to here in the U.S. For instance, there are intermittent black outs and the school doesn't always have electricity. 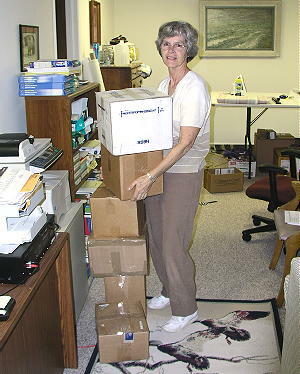 Beverly Kubik at the Kubik's home in Indianapolis, Indiana on October 14, 2007 packaging the eyeglasses into six cartons for Sri Lanka Tsunami victims. A very interesting LifeNets connection in Thailand through Ft. Wayne, Indiana! 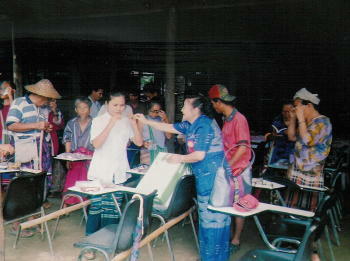 Neil Sowards, a Ft. Wayne, Indiana resident was was teaching business in Mai La camp, Thailand in October 2006. 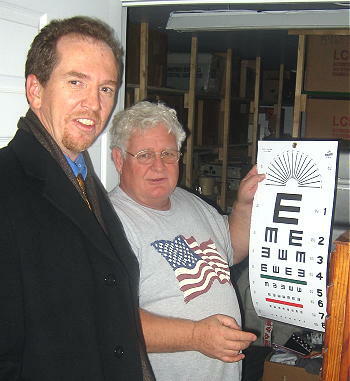 He noticed boxes of eyeglasses from LifeNets Indianapolis being distributed. He took photos and sent us a most kind letter. Praise the Lord. 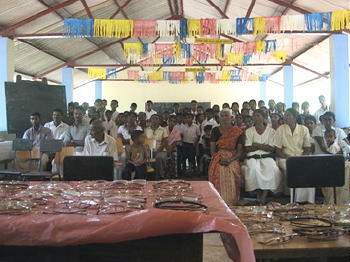 We distributed the eyeglasses during our K.K.B.C. Kawthoolkie Karen Baptist Churches semi-annual meeting where all the representatives from seven districts attended. 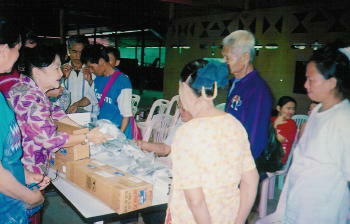 We distributed the eyeglasses on the 21st, 22nd 23rd and 24th October and a lot of people received eyeglasses. We thank all of you for your love and kindness to wards our Karen people. Please convey our love and thanks to all the donors. May the good Lord shower His endless blessing to all of you and gave you success in what ever you do. Thank you for the eye glasses. Yesterday a postman came and gave me two slips of papers for the eye glasses. It was meant for two boxes. So I went to the post office, but they told me to go to the customs office. I don't know why I had to go there. On shipments before I was able to collect them from the post office with no problem. 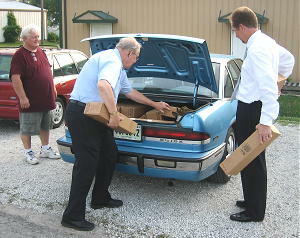 John Clester, Lion's Eyeglass Recycling-Indiana Center operation manager looks on as Tom Peine and Don Turgeon from LifeNets load trunk of car with 800 pair of eyeglasses on August 10, 2006 that were distributed on October 21-24th at Mai Lai camp in Thailand. At the custom office it was very difficult. They asked me a lot of questions. They asked me whether the eye glass were new. I told them that they were used glasses and that they were for the refugees, not me. They cut open the big box and cut open all the boxes with 50 glasses in each one. One of the customs officers told me that I had to pay 900 Bat in duty fees. But the other officer said, " They are only old glasses and there is no need to charge." The other officer was not happy with that and said "Pay 250 Bat but then left to go somewhere else. The other officer then said, "friend you can go, there is no need to pay anything." There was only one box. I didn't know anything about the other box. He gave me back what I was going to pay in duty. On Monday I'll go to the post office again and ask for the other box. I don't want to go to the custom office. Please give my thanks to all the donors. prayers. A new custom officer was there. The who wanted my money wasn't there. So I praise the Lord for that the new officer who was very kind. He didn't charge me any money. So I have my second box of glasses. We will be distributing these glasses on the first and second week of October, because we'll have our KKBC ( Kawthookei Karen Baptist Churches half yearly meeting. The representatives from seven district will be coming and we'll distribute by then. Please convey my thanks and best wishes to all the donors. 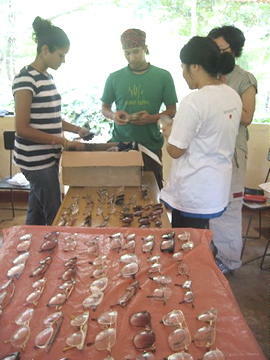 The stream of eyeglasses that began with our obtaining high quality eyeglasses from Lion's Club International has begun! We are thankful for the initial donation of 200 pair from Lion's plus another 200 pair from the Builder's Club from The Derryfield School in Manchester, New Hampshire. The Builder's Club is the volunteer community service at the Derryfield School that is a Middle School branch of Kiwanis International. 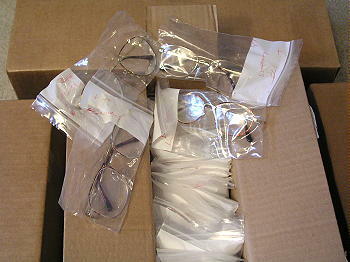 The 200 pair of glasses that we received also came from Wal-Mart and an eye glass center. We were excited to receive word from Mai La Camp near Mae Sot, Thailand that is home to 50,000 Karen refugees from the ongoing civil war in Burma that has continued since 1956. Many people in the camp only know life in the camp and are in need of many basic items such as eyeglasses that LifeNets now wants to provide. 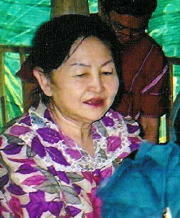 Lydia Tamla Wah is our contact on the Thai end. 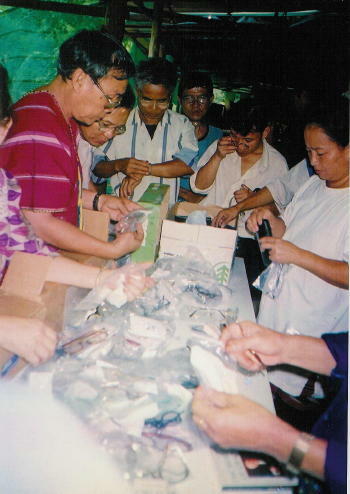 We shipped the first 200 pair of eyeglasses in April 2006 which arrived in Mae Sot on April 29th. They were distributed on June 1st and 2nd. Special thanks to Don Turgeon who is coordinating this LifeNets operation. To day another box of glasses arrived. Yesterday it arrived three boxes. Altogether four boxes arrived and two hundred glasses. We praise the Lord for having a chance to distribute the eyes-glasses on the 1st and 2nd of June. 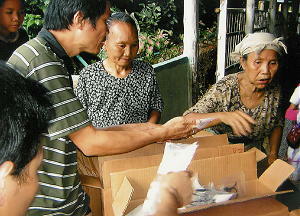 At first we thought that we were going to distribute three days, but only 1½ days it finished, because many people came. Mai La is a big camp more than fifty thousand people with the new comers. I was so sorry that more people came but no more eye glasses. Some glasses not really fit them, but as long as they can see for reading a little bit they are happy. Please convey on thanks to everybody and pray for us. 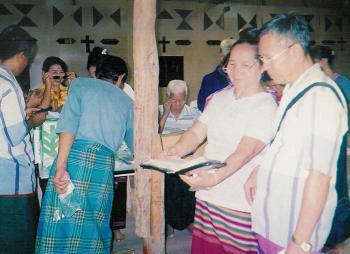 I distributed the glasses with Pastor Simon and some of the Bible school teachers. I am the treasurer of the Bible School. I arrived back to Maesot and send you this E-mail. LifeNets from its very start was involved in the collection and distribution of eyeglasses through a wonderful network of volunteers and optometrists. 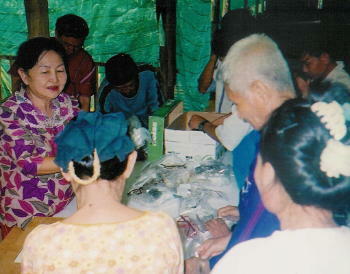 We participated in an VOSH (Volunteer Optometrists Serving Humanity) mission to Ukraine in 1999. You can see photos of that report. Our last donation in our first phase was donating 3000 pair of eyeglasses to Mexico. Before that we had shipped thousands of pairs of glasses on our containers to Ukraine and Malawi. We have taken a break from that activity for the past few years, however, have recently been asked to help provide eyeglasses to refugee camps in Thailand for the Karen people from Myanmar. Some of the refugees have immigrated to the United States and have become citizens. 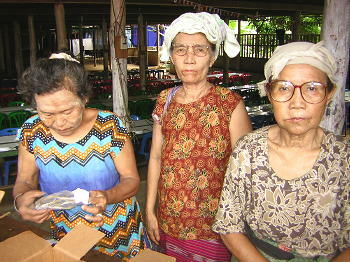 They want to work with LifeNets to facilitate the distribution of eyeglasses to the refugee community in Thailand. We have been searching for a reliable source of eyeglasses that can be sent over and fitted. We have found just a source! Working through Prevent Blindness Indiana and the Lion's Eyeglass Recycling-Indiana Center, we have found a source and means to provide sizable help. 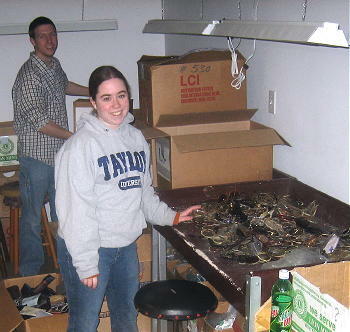 On December 5, 2005 Don Turgeon and I visited the center and met the operations director John Clester in Upland, Indiana. He showed Don Turgeon and myself around the recycling center that processes one and a half million pair of eyeglasses a year. He also spoke about the various ways in which people are properly fitted with prescription glasses. Some of the processing of the eyeglasses is done in four central Indiana prisons. 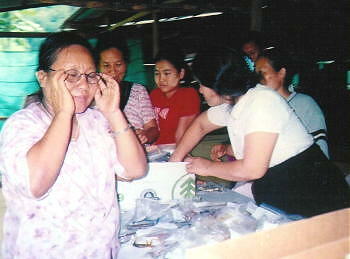 We are happy for this source of eyeglasses to help us with our mission in Thailand. 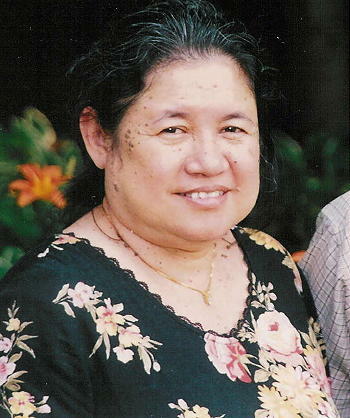 Hti Mu Belloc of Ft. Wayne, Indiana who is helping facilitate the distribution from the United States to refugee camps on Thailand.